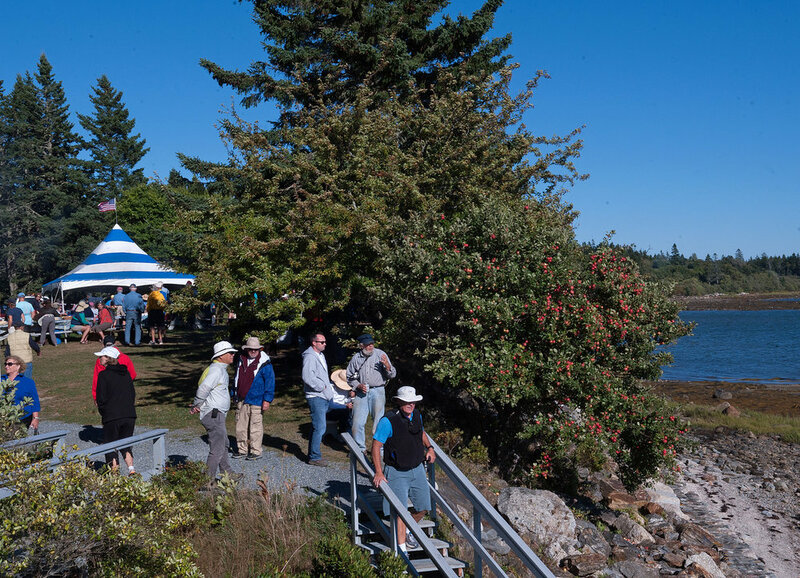 You’re at WoodenBoat’s 30th Annual Sail-In and you’ll soon have the best seats possible. You’ll be out on the water in a WoodenBoat School (WBS) skiff to greet 10 historic schooners when they come barreling into the choppy Cove, flags and pennants flying. Six of these windjammers are old-timers that hauled granite, coal, timber, and other commodities along the Atlantic coast during the 19th and early 20th Centuries: the Lewis R. French and Stephen Taber (both launched in 1871); Grace Bailey (1882); Victory Chimes (1900); J&E Riggin (1927), and American Eagle (1930). The schooners are under a brilliant afternoon sun and their bow waves are high. If you're lucky, you'll see bow wave reflections in churning flashes on their hulls. And, if you're really lucky, you'll see a schooner cowboy bulldogging a reflective bow. There's a good reason for the schooners to hurry: awaiting them at WBS are delicious steamed mussels, rousing steel band music, and engaging talk about building and sailing boats. You’ll be out there on the water again early the next morning to watch the sun’s first rays gild the schooners while the mouth-watering aroma of strong coffee, baking bread, and sizzling bacon seeps from the ships’ galleys and wafts over the becalmed Cove. And, you’ll also be there as the schooners weigh anchor in the soft light and leave the Cove under gathering clouds. You’ll be doing all this as a virtual member of WBS’s Marine Photography II class. MP II is an intense, five-day course designed primarily for advanced study, although a few less experienced photographers sometimes attend. It’s a very warmhearted boot camp run by Jon Strout and Jane Peterson, both excellent photographers and teachers who helped us to better see the parts and the whole of things. The unusual (if not unique) opportunity offered by WBS does have its difficulties for photographers who love the sea and sea-going things: the experience is like drinking from a fire hydrant, as one classmate put it. That is, we frantically take an enormous number of images that have to be culled and edited.